The games are starting to come in thick and fast, as the men are being separated from the boys in La Liga. 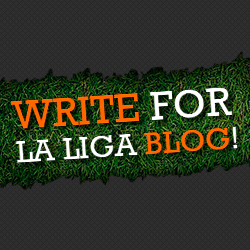 Espanyol and Athletic Bilbao rounded up matches for Week 5 on Monday night, and here at La Liga Blog, it’s time for us to honour those players who covered themselves in glory and gave a showing worthy of mention, especially in a week laden with goalless games. In goal is Barcelona in-form goalkeeper, Victor Valdes who laid a platform on which the Catalans rode to a 4-0 routing of Rayo Vallecano. Three crucial saves, including a penalty helped Barcelona keep the scoreline at 1-0 going into the half-time break. This week’s 3-man defence is led by Real Madrid man talisman Pepe who showed great determination and fighting spirit as he started Real Madrid’s comeback victory, bundling in a first half equalizer. Real Betis’ Antonio Amaya also makes the cut after a calm performance for the Andalusian side, ensuring they didn’t concede against visiting Granada. Completing the defensive line is Valencia’s Victor Ruiz. In what was regarded by many as the star fixture of the round, the Barcelona-born defender came on as a substitute and rose highest to help Valencia seal a 3-1 victory over Sevilla at the Mestalla. Our midfield is led by Atletico Madrid’s Raul Garcia who was very influential on the right side of midfield for Diego Simeone’s men in their hard-fought 2-0 win away at Valladolid. Raul Garcia’s influence didn’t stop there. The former Osasuna man got the goal that broke the dead-lock with a fantastic looping header. Garcia also weighed in with 4 shots – joint highest in the game. Another Barcelona player surfaces in our midfield as Cesc Fabregas wins a slot in central midfield. Fabregas survived in a midfield subdued by the industry, and the ball retention ability of Rayo Vallecano, notching a goal as well as a sweet assist. Espanyol midfielder, Victor Sanchez was the star of the game in the last game of Week 5 involving Espanyol and Athletic Bilbao. In what was perhaps the best individual performance of the week, Sanchez ran the game from his deep midfield role, winning a total of 8 tackles(more than anyone in the game) and most importantly grabbing two crucial goals in a man of the match showing. Valencia’s Argentine winger Fede completes the midfield roll-call after an absolutely electric and creative show against Sevilla, grabbing the assist for Jonas’ first goal in the tie, as well as winning the free-kick that resulted in Valencia’s third, scored by Victor Ruiz. 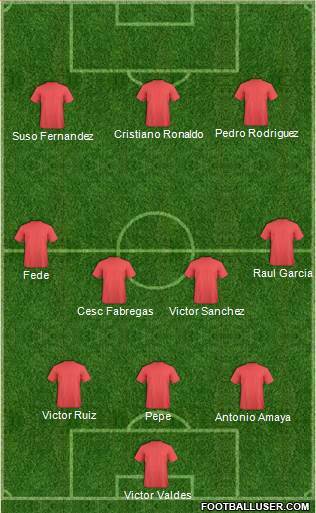 We plucked with a 3-man attack for this week, led by Almeria forward, on-loan from Liverpool, Suso Fernandez. The Spanish Under-20 forward was in ‘Superman mode’, doing everything from dribbling, creating chances, taking shots, as well as notching a fantastic goal for himself. His contributions though weren’t enough to give Almeria all three points against Levante. Pedro Rodriguez’s first La liga hat trick earns him a slot in our attack. The Barcelona man was the Man-of-the-Match as the Catalan side romped to a 4-0 scoreline over Rayo Vallecano on Saturday. Rounding up our team for the 5th round of La Liga games for this season is in-form Real Madrid forward, Cristiano Ronaldo. The Portuguese attacker oozed confidence, style and hunger as per usual as his side came from behind at the Santiago Bernabeu to beat local rivals Getafe 4-1. Ronaldo scored twice; first, a penalty towards the end of the first half and then a sumptuous back heel late in the game to secure the points. Ronaldo had a hand in all Real Madrid goals, as well as having a Match day high of 13 shots. So there you have it. Our Team of Week 5 in the Spanish La liga. Do you totally agree with our team? Who would you rather have in there and who doesn’t deserve a place in this illustrious team?